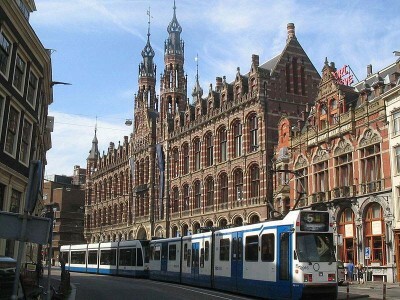 Magna Plaza is a shopping center behind the Royal Palace in Amsterdam. It is located inside a historical building that was formerly a post office from 1899. It was converted into a shopping mall in 1990. The building has a Neo-Gothic style and was designed by P. C. Peters. The atmosphere is festive, with live music often being played on weekends at the grand piano that is situated in the centre of the ground level. If you are looking for some fresh fashions to take away from Amsterdam with you, the Magna Plaza will not leave you disappointed. Whether it be clothes, jewelry, shoes or a new hair style that you are looking for, there will be something to satisfy. Some of the brands that can be found here are Swarovski, Mango, gsus and Lacoste. A day of shopping in a popular spot can be fun, but tiring. When it is time to take a break and sit down, a delicious meal may be in order. There are restaurants available as well as coffee shops. The two main restaurants are the Grandcafe Ovidius and a the more upscale The Views diner. There is more to do than shop and eat in the Magna Plaza. In late 2012, the basement level of the centre became the permanent home to digitally re-mastered and faithfully reproduced copies of 325 of Rembrandt’s painted works. Because the original paintings are owned by various collectors and museums around the world, this will likely be the only opportunity that anyone will have to view them all at once. The exhibition can be enjoyed during the regular opening hours of the plaza, but a fee is charged upon entry. The Magna Plaza can be found at the corner of Nieuwezijds Voorburgwal, Raadhuisstraat and Spuistraat. The Magna Plaza is completely indoors, making it an ideal destination for rainy, cold days. Rather than allow unfortunate weather to ruin a vacation, try heading over to the plaza to pick up some gifts and souvenirs to help you remember the trip, enjoy a historical building and appreciate some fine art all in one day.